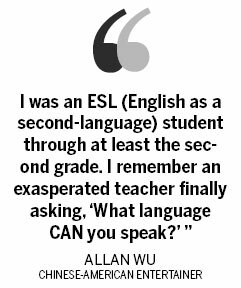 Entertainer Allan Wu, host of this weekend’s BooeyLehoo concert, wasn’t always a likely ambassador ofcross-cultural experiences, Mike Peters discovers. As a Chinese-American kid in San Marino, California,Allan Wu had no vision of himself as a bridge betweenhis family’s ancestral culture and its new one. “Myparents were first-generation immigrants from Shenyangin Northeast China,” he says. “But I was born in Americaand I wanted to be an American – ‘to be like everybodyelse’.” Today the community where he grew up is about30 percent Asian, “but back then there were just ahandful.” So young Wu struggled to learn English since itwasn’t the language of his own house, and he resistedhis parents’ urging to learn Chinese because that wasn’this vision of himself. Flash forward to the past week, when the host of TV’s Amazing Race: China Rush bounced into Beijing full of snappy banter that flowed freely between English and Mandarin. Last weekend, one-time VJ Wu was exhorting a crowd of American expats at the Temple Theater to chant “You pengzi yuanfang lai, buyi lehu (We are happy when friends visit from afar)”. That traditional Chinese saying was morphed into “Booey Lehoo”, the name of last night’s concert – emceed by Wu – that featured a slew of US and Chinese show-biz folk who support US President Barack Obama’s 100,000 Strong Initiative. That campaign is designed to boost the number of Americans studying in China from 13,000 to 100,000 in just four years. Wu himself first came to China not as a student but an actor wanna-be. He had been working as a model with the Ford agency in LA, with some VJ gigs on the side. “I liked representing the Asian community in the States,” he says, but he grew tired of being “taken” in a fashion shoot with eight Anglo-Americans, three Latinos, two blacks and himself. “I wanted to be an actor, and I wanted to work in an environment where I was part of the majority,” he says. So he snagged a $100 flight to Asia as a documents courier, and auditioned to be a VJ for MTV in Taipei. “I had to introduce a Smashing Pumpkins video” and got the job despite one small problem. “Your Mandarin is absolutely atrocious,” Wu recalls being told. That “something” could have been his gift for gab, or the raw zest for life that makes images of the muscle-shirted actor leap from his web page. Resisting one last tug from his life in LA, “I had just gotten my personal trainer certification so I didn’t have to do the “waiter in between acting gigs thing”. Wu took the plunge. “It was so, so ironic,” he says, laughing at the memory of himself as a child, so determined to be American, not Asian. “But she was very supportive when she realized how serious I was” about the opportunities on this side of the Pacific. He felt very alone at first, but buckled down to study Mandarin and savored the “cool” job at MTV, where his main responsibility was interviewing foreign artists like Julio Iglesias and Mariah Carey as they came through Taipei. When his one-year contract was up, however, he was off to Hong Kong looking for movie roles. That was flattering, Wu says with a monster grin, “but I told her that I’d done the modeling thing and what I really wanted was to act.” So she introduced him to a talent manager in Singapore, and suddenly he had a contract to make Chinese TV dramas. His new employers were “keen on new faces”, he says, and he found himself playing the lead in what turned into a blockbuster Chinese drama even though he still couldn’t speak Mandarin very well. It was a great job, Wu says, but when he learned that the producers of TV’s The Amazing Race were auditioning potential hosts for an Asian version of the show, he was itching for the job. “There were a lot of people gunning for that – hit show, fun concept, lots of travel,” he says. 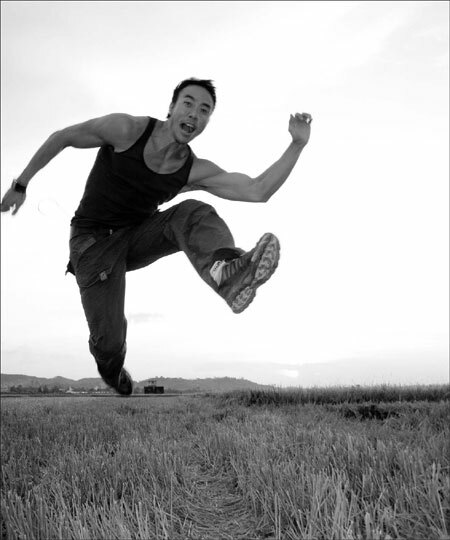 “I had been a contestant on Fear Factor, so I was a big reality-show junkie.” The candidates were narrowed down to three, and Wu says he got picked both for his on-camera skills and because once, during a sudden thunderstorm, he delighted a producer by roaring onto the set on his motorcycle, dripping wet. After a few seasons, he was approached by another company about doing a Amazing Race show for China, and once that group secured the rights to do the show officially, Wu was once again ready to pack for Shanghai. In the meantime, he had spent 10 years in Singapore, married actress Wong Li-lin and become half of a celebrity couple. He also became the father of two children. After agreeing to host Amazing Race: China Rush, Wu jokes that he laid down an ultimatum: “You don’t want to learn Chinese, I’ll bring China to you!” And a few months ago, after the show’s second season, the family was settling in Shanghai. “We’ll be looking for candidates, contestants for season three soon,” he says. Meanwhile, he’s bouncing from one Beijing stage to another, supporting the push to bring more American students to China. An “arts week” of events climaxed last night as he hosted the Booey Lehoo concert with Will.i.am, Shunza, John Legend, Sa Dingding and Coco Lee. “What I love about the 100,000 Strong Initiative is that it’s not just aiming for gifted kids,” he says. Most stereotypes are not rooted in hostility but in a lack of interaction, he adds, and exposing young people from all parts of society to China’s culture is a big step forward. You can contact the writer at michaelpeters@chinadaily.com.cn. B O O E Y L E H O O to You! …I hadn’t caught up with Jackie for quite some time so it was great to hear him explain how much he enjoys having his organization, The Jackie Chan Charity Foundation, be a partner in Booey Lehoo. Of course, all of these fun and meaningful events was a precursor to the main event, the Booey Lehoo Concert held at the Beijing Indoor National Stadium last night! And before you can say 有朋自远方来不亦乐乎 (You Peng Zi Yuan Fang Lai BOOEY LEHOO ~ Roughly Translated: We’re stoked when friends drop in from afar! ), it was time to get the show started with Sa Ding Ding after a stellar opening act from Will.i.am of the Black Eyed Peas!!! …and you know the fans were never tired of hearing Shunzi belt out 回家 Hui Jia. With our final two headliners from The Black Eyed Peas ready to take the stage, it was time to get everything ready, and it took a lot longer than any of us imagined so I literally took my time to explain what Booey Lehoo is all about along with how APSA is working with President Obama’s 100,000 Strong Initiative to bring one hundred students in four years from the US and China to study aboard. Once the patient audience was sufficiently well-versed in the concept of Booey Lehoo, it was time to bring Will.i.am and Apl.de.ap from The Black Eyed Peas on stage along with Coco Lee! And they seriously killed it with a spectacular performance with hit after hit including Where is the Love and I Gotta a Feeling! So there you have it…the first Booey Lehoo Arts Week and Concert is now a part of history, and we hope this is the beginning of something special. If you happen to be a part of it, then please spread the good word and let’s see if we can continue to work together to make it happen again one day in the near future! Big thanks to Mike and Ted from APSA, Colin Dwyer, Chad, Paul, Jessie, Alison, Chris, Sandra, Yvonne, and everyone from incredible team for putting this all together. Also, thanks to Ella for dealing with me and taking all these great pics so I can share them with all of you! Of course, one last big shout out to Motorola for all their support in making Booey Lehoo a reality for us all. Without your generous support, this definitely wouldn’t have been possible! Oh…and the new RAZR XT910 seriously rocks! And on that note, it’s time to pack up my bags and return home to Shanghai to enjoy the holidays. Booey Lehoo Arts Week is underway! Game On!!! This past Saturday, we officially kicked off the Booey Lehoo Arts Week at the Western Academy of Beijing (WAB) with a 16×16 Basketball Tournament with our Chinese and American students. Eight boys from the Boston Unified School District were invited to participate in this special friendly basketball tournament along with eight students from WAB and sixteen students from two Chinese high schools. Former NBA All-Star Jamal Mashburn flew in all the way from Kentucky to lend his support and explain to the young men how he has used basketball as a vehicle to succeed in all facets of his life. Later that day after we wrapped up the basketball tournament, the Booey Lehoo Arts Week continued with a book reading between Chinese and American authors followed by an evening organized by Project 朋友 for Americans studying and working in China to network and get together. Yesterday, we made our way to the Great Wall to watch hip hop dancer Marquis Scott take the stage on one of the Seven Wonders of the World. For some of the students from Boston, this was their first time outside of the US, and they were pumped to have the opportunity to visit this awesome historical site! Later…Marquis Scott took to the stage and tore it up on the wall! …I shared with Marquis Scott my limited repertoire of dance moves that I picked up from Dance Central on Kinect! Well, that’s another day and night of the Booey Lehoo Arts Week in the history books as we inch closer towards the big concert this coming Saturday, December 17th, at the Beijing Indoor National Stadium. If you and your friends would like to check it out, then click on over to http://www.booeylehoo.com to get the full scoop! I just realized I need to roll out soon for another day of Booey Lehoo so see you again soon! Comments Off on Booey Lehoo Arts Week is underway! Booey Lehoo to the Mayor of LA! After a brief hiatus, I’m finally back to update my blog. Whether I’m in work or family mode, it’s been difficult to find a nice pocket of time for myself to sit down and plop something down. Since my last entry, I’ve learned that people actually one use one space after finishing off a sentence with a period when typing. Funny…this is gonna be hard to get accustomed to because I’ve noticed I’m still using two spaces between sentences. At the very least, I’ll be sure to make the effort to use only one space for my FHM articles so I’m curious myself to see if I can relearn punctuation. Personally, I’m really excited about this entire initiative because it allows underprivileged students from the US to come to China to study abroad. Over thirteen years ago, I made the decision to leave the US and come to Asia, and I’ve never looked back. I still remember when my mother accompanied me to Taiwan to get settled in, and she never really understood why I wanted to come to Asia. She knew I could barely speak any Chinese, and I had absolutely no relatives here too. Nevertheless, I always believed that there could be opportunities to be discovered so I’ve stuck around in search of them. I must confess it’s never been easy, but I soon realized that it’s truly not about the destination but the journey itself. And after living in Taiwan, Hong Kong, Singapore, and now China, I know that there is still much much more to be seen and experienced.